Our Foaming Bath Whip is creamy, stable and is the foundation for a multitude products, like facial scrubs or shaving creams, making it an integral part of a crafter's arsenal. A unique base that is amazingly versatile and truly luxurious. This creamy, stable base is designed to be the foundation for a multitude of different products. From Sugar or Salt Scrubs to Shaving Creams - or Foaming Bath Meringues or even Layered Parfaits, the only limit is the crafters' imagination. Our Foaming Bath Whip base is Sulfate-Free, Paraben-Free, and does not include Propylene Glycol. The base is very mild, making it perfect for facial application products such as Shaving Cream or Facial Scrub. Try some of these additives in your Whip! Add up to 5% Oils and/or up to 10% for Butters, however, keep in mind that the greater the percentage of natural oils and butters the more the consistency of the lather changes. It is always necessary to test in small batches until you reach your desired consistency. Butters such as Shea and Macadamia Nut increase the viscosity of the base while also greatly increasing its moisturizing capabilities. Natural oils such as Avocado and Organic Virgin Hemp Seed Oil are also beneficial as moisturizers but will tend to decrease the Foaming Bath Whip's viscosity. Exfoliants - Add up to 75% percent of any exfoliant such as Bath Salts, Sugar, or Coffee Bean grounds. A 50/50 mixture of Medium and Fine Sea Salt Grain Bath Salts turn our Foaming Bath Whip into a wonderful, deep exfoliating scrub. 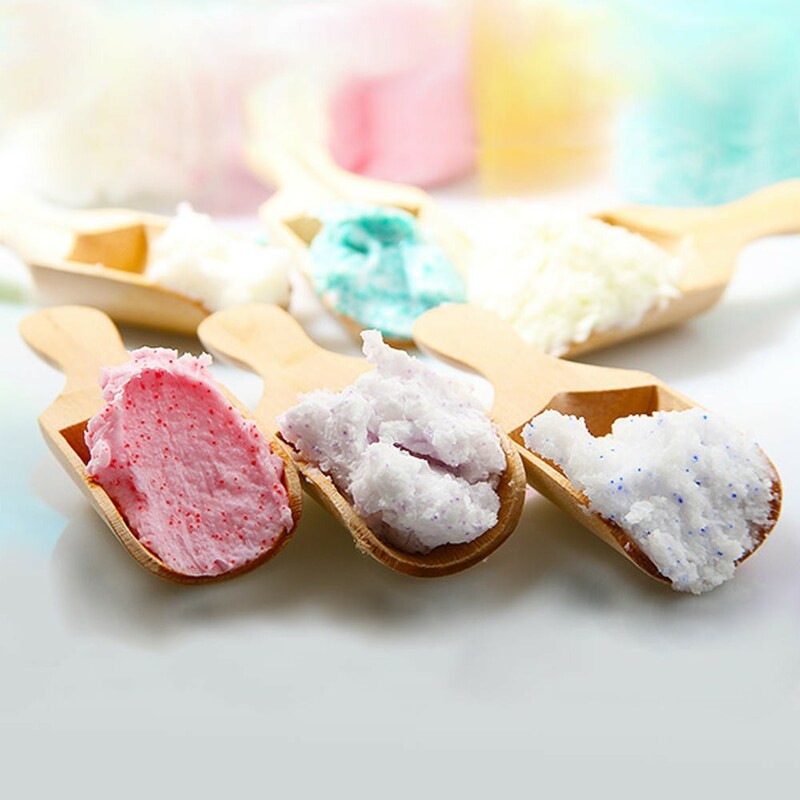 Jojoba Beads - Adding our colorful Jojoba Beads to uncolored Foaming Bath Whip gives the base a stunning color-speckled appearance while providing light exfoliation, ideal for facial products. Other Bases/Additives - Small amounts of other bases can be added for various effects. Try adding up to 5% of Glycerin to greatly increase the Foaming Bath Whip's moisturizing capabilities. A fragrance load of up to 3% can be added. For Shaving or Facial products a very low fragrance load (no more than 1%) is recommended to prevent irritation and razor bumps. Liquid colorants can be mixed in until desired hue is achieved. We recommend processing the Foaming Bath Whip by whipping it using an old-fashioned electric mixer with double blades. Begin with enough product to fill the volume around the beaters and begin whipping at a slow speed to break up the base. While beginning to whip the base add any additives while maintaining a slow speed. Increase the speed of the mixer to high and watch for the base to double in volume. Caution: Over-whipping the Foaming Bath Whip more than two times the original volume will cause it to collapse. In it's original state, this foaming bath whip base has a thicker bath butter consistency but doubles in volume when whipped. It does this all the while remaining stable and maintaining its butter-like creaminess. After application, Foaming Bath Whip leaves skin feeling deeply cleansed, rejuvenated, and appealingly soft. Our Foaming Bath Whip is very easy to work with! In just a few minutes the base can be transformed into an entirely different product, just by introducing additives or by whipping. This is often used as a foamy whipped soap base for decorating bath and body sculptures like a soap cupcake with a bath whip frosting. This product has a net wt. of 9 pounds per gallon and comes in your choice of 1gal or 5gal pails. Proudly manufactured in the USA at our facility in Corona California. The possibilities with the Foaming Bath Whip are truly endless. Let your imagination run wild and see what unique bath products you can create! I've used this product for Face Scrubs and for Bath Butters.. I've even used it for my little ones whipped with a bit of Coca Butter for that chocolate cookie scent and it is amazing that this product works so well with even the most sensitive skin..
My 5 yr old son has x-type icthyosis (think similar to eczema but with dry scaly skin rather than red patches) and with the right Oils and Butters (along with a sugar or salt mix) he comes out of the bath soft and smooth and smelling like chocolate cookies (his words and he loves it). I love that just by changing the scent later on this is a product he can continue to use as he grows older. It's also great that by mixing differently or adding different additives it works for my whole family. This product is one that I was most looking forward to because I expect this Bath Whip to be a seller. I will use this as a standalone product and as a Sugar Scrub. Great lather and doubles in size when whipped. Loved this Whipped Soap Base. I used it to make Whipped Soap Cupcake Frosting. Will buy from here again. Luckily it's right in my neighborhood so I also save on shipping. They have always been very helpful. I love this stuff! And we get it smooth just by whipping it up with Almond oil- and what I like best about it, it does not have that nasty base smell other" foaming bath butters do- so WIN! " This is the first time ordering the foaming bath whip from EC and I was excited to try it because I LOVE all the products that I have tried so far. This one comes lumpy, almost like the stearic acid didn't get melted and or dissolved. My first batch was a bust since it was supposed to be foaming bath butter. I saved it by adding a bunch of sugar and renaming it. All is not lost! What I did with the rest is very gently melted the base down over a double boiler and let the little lumps melt. Once melted I let it all go back to room temperature. Once back to room temp it whips up perfectly like a foaming bath whip should! I would have given it 5 stars if it weren't for that extra LONG step of melting and waiting for cool down. Leaves skin feeling so soft and smooth! Easy to work with.